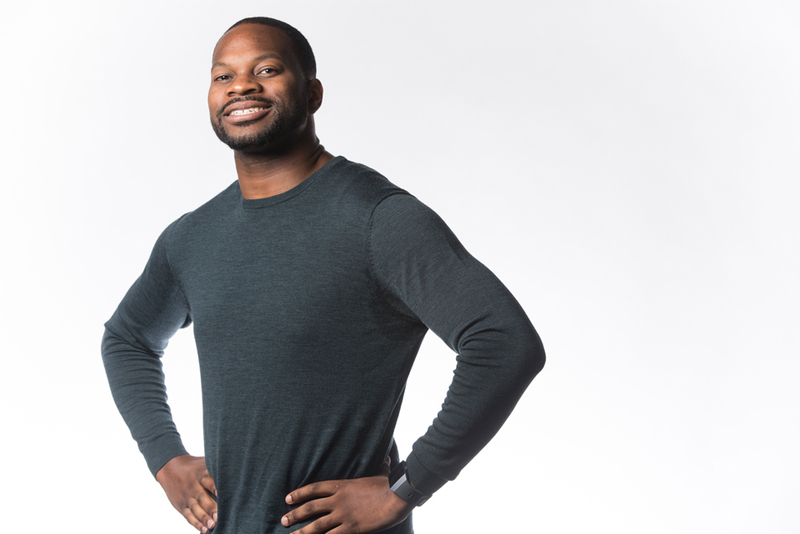 Thomas Johnson III ’13 (Music), ’18 (Teaching Credential) just completed the Accelerated Collaborative Teacher (ACT) Preparation Program in CSUN's Michael D. Eisner College of Education. This fall he will start teaching sixth-grade core math and science at the Los Angeles Unified School District’s first all-boys academy, the new Boys Academic Learning Academy of Los Angeles. Photo by Lee Choo. Thomas Johnson III knows he’s been lucky to have great mentors — adult role models who taught him how to succeed. After graduating from California State University, Northridge and preparing to embark on a career in education, he’s eager to serve as a mentor for the next generations of students. In May, Johnson ’13 (Music), ’18 (Teaching Credential) completed the Accelerated Collaborative Teacher (ACT) Preparation Program in CSUN’s Michael D. Eisner College of Education. This fall he will start teaching sixth-grade core math and science at the Los Angeles Unified School District’s first all-boys academy, the new Boys Academic Learning Academy of Los Angeles, on the campus of Washington Preparatory High School. An African-American male, Johnson said he’s excited to serve as a role model for a student body he estimates will be 75 percent African-American and 25 percent Latino. Teaching wasn’t always Johnson’s goal, but he always appreciated the mentorship he received, he said. He grew up in Culver City. His father works as a urologist in private practice and his mother is an educator — now the principal of Carthay School of Environmental Studies Magnet in Los Angeles. He also benefited from the guidance of other teachers and professors throughout his life, including Carey Christensen, a professor of music industry studies at CSUN. After earning his bachelor’s degree, Johnson worked as a recording engineer at various studios, including part-time and freelance work. At his mother’s suggestion, he tried substitute teaching to earn a steadier income. It was his most challenging classroom in those days that inspired Johnson. As a long-term sub, he inherited a class of fourth graders whose teacher had left a couple of months into the school year. The class included foster children, recent immigrants from El Salvador (including two who didn’t speak English), and other students whose personal lives provided barriers to learning. Johnson worked to get to know each student as an individual and connect with them personally. So Johnson returned to CSUN for his teaching credential in CSUN’s ACT program, a very selective, two-semester, full-time program designed for post-baccalaureate credential candidates interested in pursuing a Multiple Subject, Single Subject or Education Specialist Credential. Candidates progress through the program as a cohort, completing fieldwork during the day and coursework in the late afternoon and evenings. During the program, Johnson served as a student teacher in the Larchmont Charter School and Community Magnet Charter School in Los Angeles. He is considering returning to CSUN to complete a master’s in mathematics education. Johnson will return to CSUN this summer for a summer bridge program sponsored by CSUN’s Future Minority Male Teachers of California (F2MTC) program and funded by the W.K. Kellogg Foundation, which awarded the university a three-year grant for a teacher-preparation project aimed at increasing the number of men — particularly African-Americans, Asians and Latinos — who want to work in elementary education. The F2MTC project aims to improve the pipeline for male teachers of color throughout the CSU system so that elementary-age students of color will have increased numbers of males of color serving as teachers, mentors and role models, thereby helping to close the persistent achievement gap between white students and students of color. The F2MTC Summer Bridge Program, which is still recruiting participants, is a week-long event taking place in the College of Education from June 25-29. The program will allow students opportunities to learn how to use hip hop, the arts, social justice and other powerful tools for teaching. In the summer bridge program, Johnson will serve as a mentor for incoming minority, male high school juniors and seniors who are interested in teaching. To participate in F2MTC, please visit: https://www.csun.edu/eisner-education/future-minority-male-teachers-of-california.